This book is an entry in the Makers of the Modern Theological Mind series as was Reinhold Niebuhr. On a recent trip to ABC Books, I found the Kierkegaard volume, and I picked it up and delved right in since I seem to be in a theological phase lately (well, I guess Existentialism and Thomism last January and The Screwtape Letters last July makes for a very slow moving phase, but in my defense, I’ve started a couple books I’ve yet to finish). What I’ll take from this bit is that Kierkegaard was writing a document targetted to Danish Christians of the era and was mostly a rebuttal to Hegel. His Either/Or countered the Hegelian Thesis>Antithesis>Synthesis bit by saying that ethical choices are exclusive or (XOR, as computer folk would call them) and cannot be reconciled through creating a system or classification where both options exist and relate to one another. It’s told in two parts: the first part by The Seducer, and the second part by The Judge. These two represent the aesthetic and ethical spheres. Fear and Trembling examines the story of Abraham preparing to sacrifice Isaac and explicates on the religious sphere, which Kierkegaard puts higher than the merely ethical. The book also talks about other writings, but these are the ones I was most interested in. This book spends a lot of its few (145) pages delving into other philosophers’ and theologians’ work. We get explanations of Hegel and Plato and their systems; we get pages on the Existentialists and people in the 20th century who Kierkegaard influenced (hint: apparently everyone). We even get a whole page of defending Heidegger from his association with the Nazis in Germany. It seems like a lot of real estate on a book on Kierkegaard spent talking about others. But you can boil a lot of Kierkegaard down into pretty short sentences. 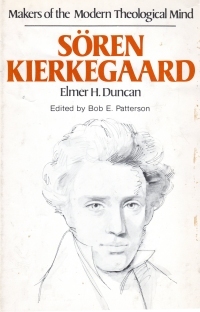 As I read it and work through Fear and Trembling, I wonder if Kierkegaard is the man who broke the Christian church. His book Fear and Trembling focuses on the religious individual experiencing something he (or she) thinks is divine and not so much on the divine. It seems a turn to the individualism that runs through Existentialism and whatnot. I’m sure there are some other revolutions and counterrevolutions that go on as well, but given how much of twentieth century thought cites Kierkegaard as an influence, I can’t help wonder if it was a bad influence.